Readers’ panel: Are efforts to increase flu vaccination rates among front-line nurses excessive and impractical? As a practice nurse who has regular immunisation training and updates, I believe the flu vaccine should be mandatory for those working in healthcare. Vaccination is a quick, cheap and painless procedure and is credited with preventing more illness and death over the past 100 years than any other medical intervention. We don’t question the vaccinations we have prior to nurse training, so why would we question this? Flu can cause tremendous harm to patients, who have the right to expect not to acquire illnesses from us. Improving uptake of the flu jab is a worthy cause, but these latest plans are nothing short of laughable. 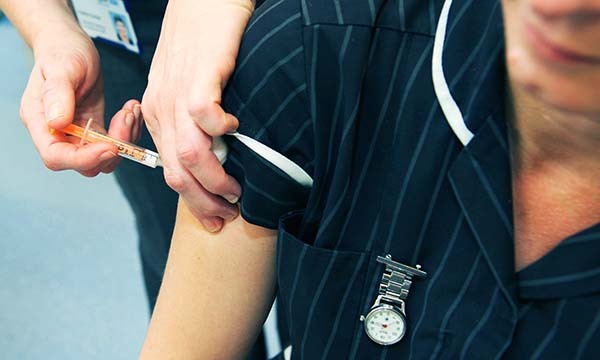 NHS England’s plan to redeploy unvaccinated staff might sound good on paper, but considering that just 68.7% of front-line staff were vaccinated last year, how do they intend to replace a third of the workforce overnight? Instead of taking this heavy-handed approach, they should review the reasons why staff choose to forgo the vaccine, and rather than trying to improve uptake through fear, attempt to dispel the concerns staff have. Front-line staff should take whatever steps they can to protect themselves and their patients from contracting flu. Although the debate over the effectiveness of the flu jab rumbles on, I am yet to hear a convincing argument against having it and fail to see why uptake is so low. However, rather than applying pressure, the best way to increase uptake would be to look at the reasons why staff are not having the vaccine and educate them about why it is so important. Although there should be a drive to increase uptake of the flu vaccine among front-line staff, any decision about whether or not to have it should be up to the individual. The proposal to redeploy staff who have not had the flu jab is ridiculous – how would the NHS cope, especially with the upcoming winter pressures? Managers should support staff to make informed decisions by improving education about the advantages of vaccination, such as protecting themselves, their family, patients and other staff.